Mexican style empanadas filled with ground beef and potatoes. I jumped on the olive oil bandwagon before there was a bandwagon to jump onto. Growing up with primarily American and Mexican cuisine meant that lard, corn oil, bacon fat and butter showed up to the cooking party most often. All tasty for sure, but none the most heart-healthy of ingredients. Olive oil did make an appearance on occasion. And when it did, it meant that an Italian meal was on the horizon: dad's famous lasagna or his fabulous meatballs with marinara the two most likely suspects. Both are legendary dishes in the Arambula household. 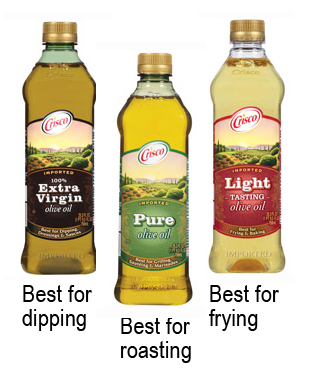 Recently I was given the opportunity to try a product relatively new to the Crisco brand: olive oil. And not just one, but three: Extra Virgin, Pure and Light Tasting. 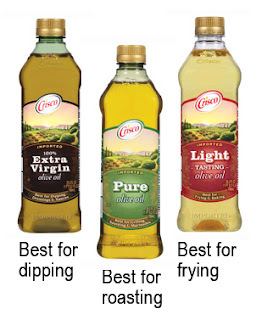 Having used olive oil as my primary cooking fat for more than 20 years now and not being particularly brand loyal to any up to this point, I was up for the taste test. I used the Pure Olive Oil to make use of some of the basil growing in pots on my patio for a pesto pasta dinner one night. It was a tasty success! The Extra Virgin Olive Oil I used for a late afternoon snack of quick bruschetta. It's super easy and not really a recipe per se. I learned this from an Italian friend years ago and every time I make it, I think of him. It really is the perfect vehicle to highlight the oil. Start by toasting up a couple of slices of sourdough. Take a clove of garlic, slice it in half and rub the cut side on one side of each piece of toast. Take half of a tomato (or whole depending on it's size) per toast and place them on the each piece of toast. Carefully slice, then chop the tomato while it's on the bread so that it soaks up all the juicy goodness. Spread the tomato evenly over the toast. Chop some fresh basil and sprinkle over the tops of each toast. Sprinkle some dried Italian seasoning and salt and pepper to taste over each slice. Finish by drizzling Crisco Extra Virgin Olive Oil over your creation. My favorite by far was the Light Tasting. Not because I don't like the taste of olive oil. Quite the contrary in fact. But what I found so surprising was just how light it was and therefore all the more versatile. My test to see just how mild tasting this oil could be? There could only be one true test in my latina culinary bag of tricks: flour tortillas. Then, to really push the envelope, I opted to make those into empanadas - the kind I grew up with - which meant pan frying the tasty creations. I used a quarter of the masa (dough) for the empanadas and rolled the rest out for my week's worth of tortillas. I have to say, I not only didn't miss the taste of butter (my fat of choice when making tortillas) but rather enjoyed the consistency produced by substituting it for the olive oil. The dough itself had great elasticity (think pizza dough) and rolled out beautifully. The finished tortilla had just the right amount of chewiness that a good homemade flour tortilla should have. Once the meat and masa is made, next comes the fun part: assembling the empanadas! Start by rolling out the masa to about 4" in diameter. Next, place about 2 tablespoons of meat on one half of the tortilla, staying away from the edges. Fold the tortilla and using your index fingers and thumbs, start at one of and roll the edges up making your way around the half-moon shape pinching to seal as you go. You can use your thumbnail to pinch down afterwards or take a fork and use it to press the seal together ensuring it's tight. In Part 2, I share with you a recipe for Apple Upside Down Olive Oil Cake that really shines. 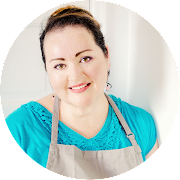 Until then, enjoy my recipes for flour tortillas, Mexican Beef & Potato Empanadas and pesto. Add first three ingredients to a large bowl. Stir to combine. Add oil (reserving the 1 teaspoon for later) and use your hands to combine well. Flour will be crumbly. Add the hot water a third of a cup at a time combining well between additions. Using your hands, gently knead the dough until it holds together and pulls away from the bowl. Once it holds together, knead the masa (dough) for three to four additional minutes. Masa should be smooth and have a good amount of elasticity. Pour the reserved teaspoon of olive oil over the masa and smooth it over the entire surface with your hands. Cover with a clean warm dishtowel and let rest for 15 minutes. NOTE: If making Empanadas, now that the masa is made, skip to the Empanadas recipe. If making flour tortillas, continue this recipe. Heat griddle. While it heats, prepare masa for rolling. Remove towel. Wrapping your hand around the masa, gently squeeze the masa between your index finger and thumb, pinching away about a golf ball size of masa. Continue until you have about 18 - 24 small balls of masa returning them to the bowl as you go. Keep the pre-formed balls covered while rolling to keep them from forming a "skin" and drying out. Place one ball of masa into a shallow bowl of flour. Holding the ball over the work surface, using your thumbs to form a disk turning the masa clockwise while pinching in order to keep it round. Once it's about 1/4" - 3/8" thick, place a little more flour on work surface, lay the masa in the middle of it and use a rolling pin up and down a couple of times while applying a little bit of pressure. Masa should be an elongated oval shape. Flip the tortilla turning it a quarter turn. Roll up once, then down. Repeat the flip and turn until the shape is round and about 1/8" thick. As it gets thinner, take care not to be too rough as the thinner the tortilla gets, the more easily it will "tear." If it tears, use your fingers to pinch the tortilla back together. Place the tortilla onto a hot griddle. After about 30 seconds, it should start to bubble up like a pancake does. Once the tortilla is covered in little bumps, carefully turn over. Using a clean towel, dab the tortilla applying a some pressure the surface to force hot air pockets to form (careful! If they pop on you, you'll get a steam burn). Flip once more and allow to puff up. You want some of the bigger bubbles to turn golden and the rest of the tortilla to become opaque. Take care not to burn them. Remove tortilla and place in a cloth covered bowl or tortilla warmer. Continue with the rest of the masa. For the meat: Heat a large skillet to medium hot. Add 2 tablespoons (or enough to cover) the pan. Once shimmering, add potatoes. Reduce to low, cover and let cook for three minutes. Remove lid, stir potatoes and add onions. Sprinkle the vegetables with a little salt and freshly ground black pepper. Cover and cook for about 8 minutes (or until the potatoes are fork tender) stirring occasionally. Remove cooked potatoes from pan. Set aside. In same skillet, add ground beef breaking it up with a wooden spoon. Add cumin, garlic, coriander, paprika, chile, 1 teaspoon salt and the pepper. Stir to combine. Cook for 5 minutes or until meat is no longer pink. Add back the potatoes. Add the tomato sauce, stir and remove from heat. Place mixture in a bowl and set aside. For assembly: Wrapping your hand around the masa, gently squeeze the masa between your index finger and thumb, pinching away about a walnut-sized ball of masa. Continue with remainder of masa returning pre-formed balls to the bowl as you go. Keep masa balls covered while working to keep them from forming a "skin" and drying out. Place ball of masa into the flour, covering the ball with flour. Remove and while holding the masa over your clean dry work surface, use your thumbs to form a disk turning the masa clockwise while pinching in order to keep it round. Once it's about 1/4" - 3/8" thick, place a little more flour on work surface, lay the masa in the middle of it and use a rolling pin up and down a couple of times while applying a little bit of pressure. Masa should be an elongated oval shape. Flip the tortilla turning it a quarter turn. Roll up once, then down until your tortilla is about 4" round. Take about 1 - 2 tablespoons of the meat mixture and place on half of the tortilla in a half moon form. Gently pull over the other side of the tortilla to cover the meat, making sure you have a bout 1/4" of meat-free edge along the seams. Starting on one end of the seams, gently roll up the masa to fit snuggly against the meat and pinch as you work your way around to the end. You can use your thumbnail to "score" the rolled seam to make sure it's a tight seal or use a fork. Place on a platter. Cover and continue until all the meat and/or masa is gone. Heat a skillet to medium hot. Add 1/2 cup of oil or until oil is about an inch high. Once oil is shimmering and hot, gently lay in the empanadas, always starting at the back of the pan and laying them in AWAY from you so as to not risk splashing yourself with oil. Place enough of the empanadas into the pan to fry them without them touching and leaving enough room for you to flip them easily. These will cook fairly quickly -- about 3 minutes on each side or until nice and golden brown. Always flip them away from you and once they are ready, remove to a paper towel lined platter. Continue until all the meat pies are cooked. Serve immediately with a side of Spanish rice and re-fried beans. Garnish with any combination of fresh salsas, sour cream, guacamole, chopped fresh cilantro or pico de gallo. To start, pan toast the nuts. Add pine nuts to a dry, nonstick heated skillet shaking the pan constantly to keep them from burning. Remove from pan when they're lightly brown (this will bring out their nutty goodness. Set aside to cool for about 15 minutes. Once the nuts are cooled, place them and the garlic into a food processor, pulsing a few times to get them into a coarse consistency. Add the basil and spinach a little at a time, pulsing between additions. Slowly add the olive oil in a constant stream while the food processor is on. Stop to scrape down the sides of the food processor with a rubber spatula (add a few tablespoons more oil if it’s too thick/dry). Add the grated cheeses and pulse until well blended. Add salt and freshly ground black pepper to taste. Place in an air tight container, pouring a little olive oil over the top to just cover so air won't come into contact with the basil. Store in a tightly sealed container in the refrigerator for up to two weeks (or freeze for up to three months). ***The fine print: As a participant in the FoodBuzz Tastemaker Program, Crisco provided me with samples of their oil for this post. Keep sharing more and more.